Automobile industry evolves according to needs of the buyers and we can witness that trends are changing and if companies want a good market share they have to satisfy different types of expectations. The growing popularity of pickup trucks certainly attracts attention of automakers and they are looking for their chance. The result is more announced pickup models from different brands and among them is Hyundai who presented its idea of modern pickup version at 2015 Detroit Auto Show. 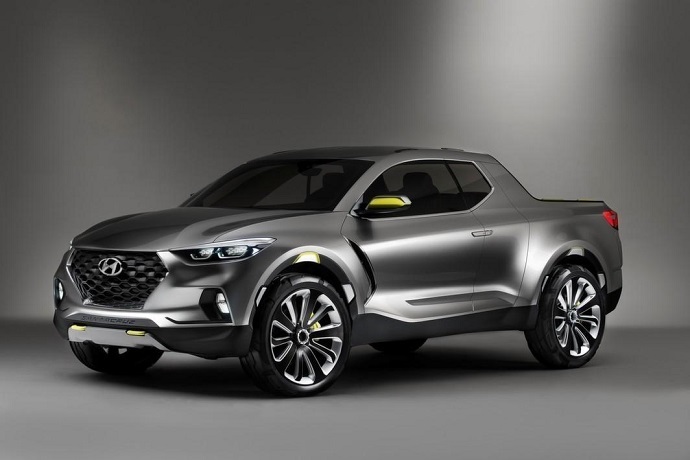 The model is called Hyundai Santa Cruz Concept and it isn’t actually full-size truck yet it blends desirable attributes from both pickup trucks and CUVs as well. That is obvious at the first glance on this concept model which has compact footprint of crossover that allows it better maneuverability and easer parking in urban areas but also thanks to the pickup’s attributes it offers its practicality. Hyundai has actually done some research which proved that there is considerable population of younger buyers which want the vehicle that offers light duty hauling capability and urban practicality but won’t be large, costly and fuel inefficient as full-size pickups. In that context, this concept model is designed on unibody platform, equipped with diesel engine and configured as extended cab model. The design of the Hyundai Santa Cruz Concept model is just like on any other concept model done with exaggerated features like large openings, wheels, radical cuts and shapes. The front side is designed with large hexagonal grille with honeycomb mesh pattern. It is flanked by modern-looking headlights which add it more aggressive look. Bellow sits nicely sculpted bumper which houses deeply sculpted ports for the fog lights while under it protrudes skied plate. The model also includes sharply molded hood which also adds to its appearance. Concept model also looks very attractive from the side point of view thanks to the large wheels, masculine fenders, streamlined front pillar and pair of interchangeable character line and boldly sculpted door sills’ area. The tailgate and rear bumper area are also boldly sculpted and attractive. The cabin takes extended cab form with rear-hinged suicide doors. It also includes quite short cargo bad but fortunately it features drawer-like mechanism which enables it to be extended to the length that is similar to other beds on mid-size trucks. This mechanism operates in that way that whole rear area can be pulled out including tail gate, taillights and rear bumper. The bed also comes with slide-out cover and tie-down hooks. As mentioned, this concept model is based on unybody architecture instead of body-on-frame construction like trucks. This means that ride quality is putted in front of off-raod capability and towing capacity. The company’s officials actually stated that max payload and towing as well as ground clearance aren’t main concerns at all as the model hasn’t been designed to be direct competitor to traditional trucks yet it is rather and alternative for the crossovers. The whole strategy is to attract wider buyer basis in order to ensure a bigger market share. Behind the modern and attractive design, the Hyundai Santa Cruz Concept model comes powered with turbo diesel engine. It uses a 2.0 liter oil-burner which is rated at 190 HP and peak torque at 300 pound-feet. This engine is coupled with Hyundai’s HTRAC all-wheel drive which is used on brand’s production models. Hyundai claims that system is optimized to return fuel economy in “high 30 mpg” range. Considering that Hyundai isn’t the brand known in pickup truck class, the Hyundai Santa Cruz Concept was big surprise but also promising moment in modern automobile industry. All indicates that Hyundai is very serious about this concept and it seems that production version is very possible. Some reports also suggest that green light was given for production model and it is matter of time when the company will announce it. The company considers the US market as priority for new vehicle where it will be good alternative for other mid-size trucks like Toyota Tacoma, GMC Canyon and Chevy Silverado. This model will however be the closest rival with Honda Ridgeline which is currently only unibody configured pickup truck. The production model is also expected to offer additional powertrain and probably front-wheel drive as standard configuration. As for the price of the production version, the base models are expected to be valued in mid-$20k range.